Great Smoky Mountains Superintendent Dale Ditmanson has announced that the popular Cades Cove Loop is expected to reopen Saturday, April 24, about a month earlier than had been projected. Ditmanson credits capable management and aggressive efforts by the contractor, APAC-Atlantic, Inc., Harrison Division, and the cooperation of the Federal Highway Administration, in conjunction with financial incentives built into the contract for the early completion. In recognition of the completion of this long-overdue project and of National Park Week, the Park is planning two celebratory events. A Field Day has been set for Saturday, April 24 when only bicycles and pedestrians will be permitted on the road until noon. On Sunday morning, April 25 the Park and the Friends of the Smokies are planning a one-time-only “Cades Cove Loop Lope”, which will offer pre-registered runners a choice of the full 11 mile loop or a 3.5 mile loop course. Both events are being planned to minimize visitor inconvenience. Historically the Park has declined requests to permit foot and bicycle road races in the Cove, due to the heavy visitation that Cades Cove attracts and the knowledge that events of this nature would be very popular. In this instance, Park managers, in partnership with Friends of the Smokies, are organizing this one-time event in recognition of the first major facelift that the Loop Road has had since 1978. The weekend’s activities also coincide with National Park Week, a nation-wide celebration in National Park areas when visitors are encouraged to get out and enjoy the great American outdoors. The Park has traditionally limited the Loop Road to bicycles and pedestrians until 10 a.m. each Saturday and Wednesday from early May through September, but they have extended this one “bicycle closure” until noon to accommodate an anticipated greater number of people. They are also expanding the parking area available to Loop visitors through use of one of the mowed pastures, and will be limiting access to the Cove beyond the Townsend Wye to those coming to bike or walk until noon on Saturday the 24th of April. Details for those interested in participating in Sunday’s run will be posted on the Friends of the Smokies website in the next several days, but it is expected that participants will have to pre-register. Participants are encouraged to ride share due to parking limitations; a maximum of 150 vehicle passes will be made available on a first come, first served basis. As with all funds raised by the Friends on behalf of the park, the event fee will go to support a wide range of Park programs. The run will step off at 8:00 a.m. so that the road can be re-opened to vehicles by 12 noon. Due to very limited parking at the beginning of the Loop Road, vehicle access past the Townsend “Wye” will be restricted to registered runners and campers until the race is over. In addition to the road improvements, visitors to the Cove will also be able to view improvements to the Cades Cove Store and Bicycle rental facilities, which have taken place over the past several months. The seventh annual National Natural Landmarks photo contest is now underway. Each entrant may submit up to three photographs to the contest, but each photograph must be from a different National Natural Landmarks (NNL) site. Please note a change in the contest rules this year. To promote greater diversity of NNL sites represented in the contest and calendar, images of the 13 NNL sites featured in large format in the 2010 calendar will not be accepted. These images can be found by clicking here. Click here for the official rules and entry form. Be sure to visit and photograph your favorite NNL today. To find a NNL near you, please click here. There are more than a dozen sites in the region just outside of the Great Smoky Mountains. The National Natural Landmarks Program, administered by the National Park Service, recognizes outstanding examples of our country’s natural history and supports landowner’s voluntary conservation efforts. It is the only natural areas program of national scope that recognizes the best examples of biological and geological features in both public and private ownership. The 586 NNL sites nationwide possess scientific significance, educational value and exceptional scenic beauty. The contest ends on June 30th. For more information, contact Heather Germaine, 303-969-2945, heather_germaine@nps.gov. I just came across the 2010 Smokies Trip Planner on the GSMNP website today. After the 17-page PDF file opens up, the first topic at the top of page one is Tips on Auto Touring in the National Park. As everyone knows, traffic congestion is a major issue in the Great Smoky Mountains, especially on the Cades Cove Loop Road. In fact, Park Superintendent Dale Ditmanson stated in the 75th Anniversary issue of Smokies Life Magazine that he and park officials are looking for ways to solve the traffic problems that plague the Smokies. In the article he floated the idea of banning cars in Cades Cove and using a circulator bus system. Although he considers this solution impractical for a couple of reasons, at least the problem is recognized at the top of the food chain. All of which brings me back to the 2010 Smokies Trip Planner. I really don't understand why the Park continues to encourage people to auto tour in the Smokies. I'm not trying to take away anyone's right to drive on any road in the Smokies, but I do think it's ridiculous that the Park goes out of it's way to encourage people to jump in their cars and clog up the roads. In addition to the planner that can be picked up at visitor centers, there are auto touring booklets that can be purchased, and there's a page on the Park website dedicated to auto touring. This really doesn't make sense to me. This is actually a no brainer. I know the impact on traffic would likely be only minimal, but why go out of your way to make it worse? Here's a suggestion I just thought of as I was concluding this post: Why not blaze a couple of new trails that explore the interior of Cades Cove? You could have trailheads leading from the parking area just before the one-way loop, as well as from the two cross roads; Hyatt and Sparks Lane. The trails could explore the open fields as well as some of the historical structures in the area. This would give people the opportunity to get out of their cars and have a much more meaningful experience with Cades Cove. Would this cut down on congestion? I think it would - but it probably wouldn't make a significant difference. However, combine this with other solutions such as shuttle buses and the park could put a dent in the problem (if there's anyone from the park service reading this, please comment on the feasibility of new trails in Cades Cove). I've often wondered why there weren't any trails in the interior of the Cove anyway. I would love to be able to explore this portion of the park. Should I keep moving if I'm bit by a rattlesnake? That was the question asked of Buck Tilton, a.k.a. the "Medicine Man" in the Ask the Expert section of Backpacker Magazine. 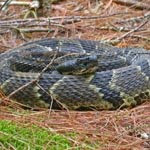 Given that the Great Smoky Mountains are home to timber rattlesnakes and northern copperheads, Tilton's response is probably good advice to know before heading out onto the trail. However, please remember that the likelihood of being bitten, or even seeing a venomous snake in the Smokies, is extremely small. Furthermore, there is no record of any human fatalities due to snakebite in the park’s history. Q.} I recently came off trail in the night and nearly stepped on a rattlesnake in the Smokies. If bitten and you are an hour or two out, would you recommend to keep moving to get out? There's not much scientific evidence to cite here, but experts generally agree, yep, keep moving when you're only a couple of hours out. Once you're to a vehicle, head for the nearest hospital where antivenin should be available if you need it. But, take it easy while you're hiking. You want to keep your circulatory system as quiet as possible, preventing a rapid spread of venom, which is why the best response if you're way off the road is to hunker down, get still, keep the bite site about the same level as your heart, and wait for someone to come get you (which, of course, might not happen if you're alone and unable to call for help). On the plus side, snakebites in the U. S. seldom cause human fatalities. In fact, one bite out of every four to five does not induce venom. Rapid onset of pain and swelling would be indicators that you are not one of the venom-free bitten humans. While 23 species of snakes live in the Great Smokies, some of the places your most likely to encounter one are near old buildings and around stone fences. Most people familiar with the Great Smoky Mountains are aware of the Spring Wildflower Pilgrimage that takes place every April in the Park. If you can't get enough of the beautiful wildflowers of the Southern Appalachians you can head a little further north for the Wildflower Weekend at Shenandoah National Park the following month. Wildflower Weekend in Shenandoah will be held on May 8-9 this year. Several hikes, walks and wildflower related programs are scheduled throughout the weekend. More than 1,300 species of plants thrive within Shenandoah National Park. Earlier in the week, federal government officials unveiled the first five “America the Beautiful” quarters, featuring America’s four oldest national parks – Hot Springs, Yellowstone, Yosemite and Grand Canyon – and Mount Hood National Forest. The five quarters are the first of 56 that will be issued between 2010 and 2021. They will include 48 National Park sites, two U.S. Fish and Wildlife sites, and six U.S. Forest Service sites. The coins will be issued sequentially in the order in which the featured location was first placed under the care of the federal government. Hot Springs National Park was established as Hot Springs Reservation in 1832 and later became a national park. Yellowstone National Park was established in 1872, followed by Yosemite in 1890 and the Grand Canyon in 1893. 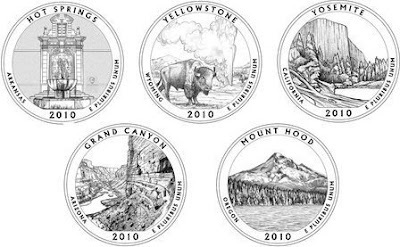 Quarters featuring Great Smoky Mountains National Park will be issued in 2014 while the Blue Ridge Parkway coins will be issued in 2015. For more information about the America the Beautiful Quarters Program, please click here. Cumberland Gap National Historical Park will be offering a full moon hike this coming Monday. On the night of March 29th, park rangers will offer a full moon hike into the historic Cumberland Gap. Park Naturalist Scott Teodorski explains “March brings with it the whispers of spring and the renewing of nature’s wondrous cycle. Should the night be warm, the calling of the mountain chorus frogs and spring peepers will be deafening. And a real treat would be hearing the call of the whipporwill. We’ll plan the hike so we will be approaching the saddle of the historic Gap as the moon rises above the mountains.” Full moon enthusiasts should meet at the Thomas Walker parking area at 8:00 p.m. and wear good walking shoes for the easy 1.2 mile round trip hike. Cumberland Gap will be offering a couple of programs this weekend, including the Kentucky National Parks Movie Fest on Sunday, March 28th. For information on hiking trails in Cumberland Gap, please click here. Secretary of the Interior Ken Salazar announced on Tuesday that all 392 national parks will have free admission during National Park Week, April 17 to 25. Parks will also offer additional family friendly activities and special offers on tours, lodging, food, and souvenirs. There will be hundreds of family friendly events on Saturday, April 24, for National Junior Ranger Day. Each child participating in Junior Ranger activities will receive a certificate, patch, or pin. Other National Park Week highlights include the 40th anniversary of Earth Day and the 75th anniversary of the nation’s most visited national park – the Blue Ridge Parkway. Normally, 146 of 392 national parks charge entrance fees ranging from $3 to $25. The other 246 do not charge for admission. The fee free waiver for National Park Week does not include other fees collected in advance or by contractors—such as fees charged for camping, reservations and use of concessions. A listing of parks and promotions is available at www.nps.gov/npweek. The Association of Pedestrian and Bicycle Professionals has opened a dialogue on why women and girls cycle less than men with an online survey and free webinar. All women are invited to take a 15-minute online survey about why they cycle or why they don't cycle through May 15, 2010. The public is also invited to attend a free webinar on women and cycling on Wednesday, Mar. 31, at 3 p.m. Space is limited and pre-registration is required. The National Park Service (NPS) is proposing to rehabilitate 14.5 miles of Newfound Gap Road (U.S. 441) on the Tennessee side of Great Smoky Mountains National Park and to reconstruct many of its stone masonry guardwalls. The work area runs from the Park’s entrance near Gatlinburg to the North Carolina state line at Newfound Gap. Work is scheduled to begin in November 2010 and be completed in phases over the course of six years. The NPS is soliciting public comments in response to an Environmental Assessment (EA) which evaluates the potential resource and other impacts of that proposed action. The EA examines two alternatives; no action and the NPS preferred alternative. The preferred alternative consists of improving the safety of Newfound Gap Road, improving the condition of the road and associated features, and maintaining the integrity of Park resources. Specific activities under the proposed action, would include: rehabilitation of the road surface, rehabilitation of road shoulders where needed, reconstruction of settled sections of roadway to restore stability of embankment, rehabilitation of existing stone masonry guardwalls, reconstruction of guardwall sections to meet current crashworthiness criteria in areas with a demonstrated safety risk, and adding new guardwall and/or guardrail extensions or transitions in areas. The EA is available, and comments may be submitted online at the NPS Planning, Environment and Public Comment website. Comments must be received no later than April 21, 2010. Join Missy Kane and Ryan Baxter of Blue Ridge Mountain Sports for an informative session on day hiking basics, local hiking groups and local hiking opportunities. The purpose is to provide knowledge of hiking fundamentals required to build confidence and ensure safety. Sponsored by Friends of the Smokies Get on the Trail program and Blue Ridge Mountain Sports. For more information, call Sarah at 932-4794 or email fotssw@bellsouth.net. A foot or more of snow still covers many high elevation trails in the park and will likely take several weeks to melt. We have also received reports of numerous downed trees on high elevation trails. Travel on these trails is difficult at this time. The National Weather Service is reporting that there are still 14 inches of snow on the ground atop Mt. LeConte, but only 2 inches at Newfound Gap. Should lost or injured hikers be charged for backcountry rescues? That is the poll question currently be asked on the Blue Ridge Outdoors website. This issue seems to be growing within the outdoor community as I've been seeing more debate about it in recent months. Surprisingly, 63% of the respondents to this poll have said "Yes" so far. Let me clarify. I think it should be evaluated on a case by case basis. If an experienced, well prepared hiker, climber, etc. has something happen to them that is out of their control, something that they couldn’t have prepared for like a rock slide, or other natural event, then no. Now, if some yokel goes galavanting out into the backcountry with no experience, knowledge and completely unprepared then yes. Please click here if you would like to cast your vote. The Southeastern Foot Trails Coalition will hold its biennial conference in Tennessee the weekend of May 20 - 23, 2010. The conference will be based at the DuBose Conference Center in Monteagle, TN. Members of hiking and trail building organizations from across the southeastern United States, partners of the coalition and any other interested parties will gather in Tennessee for a weekend of hiking, education, fun and celebration of the foot trails experience. Several guided hikes of varying length and difficulty will be offered in nearby locations. Simultaneously, at DuBose Center, there will be a series of educational sessions of varying length on tracks which address needs and interests of the hiking and trails community. Social activities will provide opportunities to share in fun with other participants and make new friends in the "trails community". The DuBose Center is located about an hour northwest of Chattanooga, a mile off Interstate 24. The Carolina Mountain Club's biennial Map Course will be held on Saturday, April 17th. It will be a one-day course, half classroom, half fieldwork. New this year will be the coverage of fundamental GPS techniques. Whether you have a GPS unit or not, this course will give you basic map-reading skills and the techniques needed to stay found. The Carolina Mountain Club is extending an invitation to anyone interested in helping to extend the Mountains-to-Sea Trail (MST) this Saturday, March 20th. The club hopes to have a large group to help complete another section of the MST heading south to the Soco Gap Overlook. Volunteers can meet at the Moose Cafe at 9:00 AM for car pooling. Or you can meet at the Soco Gap Overlook of the Blue Ridge Parkway at 9:30 A.M. (intersection of Blue Ridge Parkway and Rt. 19 near Maggie Valley). Tools will be available but if you have digging tools of your own, please bring them. On March 23, the Appalachian Trail Conservancy and town leaders from Franklin, N.C., will hold a ceremony celebrating the designation by ATC of Franklin as the newest Appalachian Trail Community, with a luncheon and proclamation signing. Mayor Joe Collins; ATC’s Board Chair, Bob Almand; and community representatives will speak. The ceremony will be held at Town Hall board room, 95 East Main Street, Franklin 12:00–1:00 p.m. The ceremony is part of a week long celebration in Franklin. In addition to the official welcome, Walking with Spring - a series of A.T. related presentations and films - and a photography contest, will be held that week. A few days later, April Fools Trail Days (April 2 - 3) welcomes thru-hikers of the Appalachian Trail as they start their journey north to Katahdin. Appalachian Trail Communities is a new program of the nonprofit managers of the Appalachian Trail, highlighting the value of trailside communities and towns as a driver for sustainable economic development and the importance of the towns to the A.T. as agents in protecting its complex recreational, volunteer, educational and environmental resources. Smokies recruiting for "Elk Bugle Corps"
The Great Smoky Mountains National Park Volunteers-in-Parks program once again is enlisting volunteers to assist with managing people and elk in Cataloochee Valley, N.C. The "Elk Bugle Corps" program assists park rangers with providing visitor information on responsible elk viewing practices and elk behavior and to help with parking and traffic management. Last year, the group of volunteers totaled some 80 persons from around the area. They donated over 7,000 hours of service and spoke with over 85,000 visitors. Many of these volunteers are returning, but there is a need to replace a number of volunteers who are moving on to other opportunities this summer. The Park’s goal is to recruit and train new volunteers who can commit to assisting on a recurring basis. Each volunteer is asked to work at least two scheduled, four hour shifts per month starting the second week in May and continuing through November. This target period is during high visitor use from late spring during the elk calving season through the end of the fall color and elk mating seasons. The program’s greatest need is for volunteers to work the afternoon shifts which will run from approximately 1 p.m. to 5 p.m. throughout the summer. Although elk are not as active at this time of day, Cataloochee Valley is still relatively busy and the volunteers have the opportunity to spend more time with individual visitors. Cataloochee Area Park Ranger Mark LaShell commented, "We feel the program is a win-win situation. We continue to receive positive feedback from the Cataloochee volunteers who enjoy working in such a beautiful mountain valley and from visitors who receive a better experience having these volunteers to interact with in an otherwise remote area with no personal services." For persons interested, two informational meetings and new volunteer orientation sessions will be held in Cataloochee Valley at the ranger station on April 15 and 17, from 1 p.m. to 5 p.m. All potential volunteers will be required to attend one of the orientation sessions as well as one full day of training during the last week of April and the first week of May. Anyone who is interested in volunteering and attending one of the orientation sessions is asked to email Ranger Mark LaShell or phone (828) 269-3161 (email is preferred). No that isn't gobbledygook - that is an actual word. In fact, Lake Chargoggagoggmanchauggagoggchaubunagungamaugg is the longest place name in the United States. I learned about this locale the other night while reading River-Horse, by William Least Heat-Moon, who is also author of the highly acclaimed Blue Highways. River-Horse is about Least Heat-Moon's crossing of America by boat. Along his journey he discusses this lake near the town of Webster, Massachusetts. The 45 letter name is the longest place name in the United States and 6th longest in the world. It's an Algonquian word that approximately means "Englishmen at Manchaug at the fishing place at the boundary" and was applied in the 19th century when white Europeans built factories in the area. Today most people use the more common name, Webster Lake. However, the official website of the town of Webster considers the longer version correct. Man drives into rockslide on "The Dragon"
Check out this video of a man driving into a rockslide yesterday on U.S. 129, also known as “The Dragon”. The slide occurred on the southbound lanes of U.S. 129 about two miles south of Chilhowee Dam. There were two drownings in four river-related incidents in the Chattahoochee River National Recreation Area in northern Georgia last weekend, largely due to the first nice weather in months combined with high water levels on the river. On Saturday, March 6th, a fisherman was swept into some rapids just below the Jones Bridge area, which flipped him upside down in his float tube. The fisherman was unable to upright himself and was underwater for approximately five minutes. CPR was begun by a fellow fisherman, but was unsuccessful. The fisherman was wearing a life jacket. On Sunday, March 7th, two men were in a boat that struck a rock just below McGinnis Ferry. Both men were thrown from the boat when it capsized. Another boater in the area witnessed the accident and was able to save one of the two men, but was unable to locate the other. Search efforts continued until he was found around noon the next day when a spotter in a Georgia State Patrol helicopter located the body about two miles downstream from the accident scene. Rangers then recovered it. Personnel from the Georgia Department of Natural Resources and from the Johns Creek, Forsyth County and Gwinnett County Fire Departments all played key roles during the entire SAR. Neither of the men were wearing life jackets. The other two incidents involved overturned canoes and a fisherman caught in the rising water by a scheduled release from Buford Dam, both resulting in only minor injuries. Google Maps adds "bicycle route finder"
Last week, in conjuction with the opening day of the National Bike Summit in Washington DC, Google maps launched a Beta version of its new direction finder for bicycle routes. The new map tool will help cyclists find the quickest, safest way from Point A to Point B. Apparently cyclists have been advocating for Google to add a layer for bicycles to its "Get Directions" function for some time now. A petition started by Peter Smith at Google Maps 'BikeThere' received more than 50,000 signatures from bicyclists who wanted the service. The bicycle route finder uses data gathered on bike paths, bike lanes and low-traffic streets to arrive at the suggested route. Google staffers are emphasizing that this project is in Beta, and have built in ways that users can inject their feedback into the results at the "Report a Problem" area. The results may not show the most direct route in some cases. Not only safety, but topography is also factored into the route-finding formula so that cyclists can avoid steep hills, etc. > Please click here to give the new map tool a "test drive." > Click here for information on bicycling in and around the Great Smokies. The Great Smoky Mountains Association published their latest Youtube video this week. This time the GSMA takes viewers along a hike to Hen Wallow Falls near the Cosby Campground. Along for this hike is Steve Kemp, author of several books, and a writer and editor for Great Smoky Mountains Association. The video explains how the nearly 100-foot Hen Wallow Falls received its name. Another tidbit that I thought was interesting was learning that Sphagnum moss was used for diapers for infants, and as a last resort, bandages for wounds. For more information on hiking to Hen Wallow Falls, please click here. High on LeConte, that's the name of the new blog from the folks that run the Mt. LeConte Lodge. As I mentioned in a posting earlier in the week, the winter caretaker at the LeConte Lodge is retiring his current website as of today, and has already launched a new one. In that same posting I mentioned that the management for the LeConte Lodge has decided to publish their own blog on their own website. I would just like to share with you the new LeConte Lodge blog. The management just wanted a more permanent site that would be around for years to come. I hope you enjoy the new one as much as you liked Doug's. We are very grateful to him for watching the lodge this winter and sharing his experiences with you. I hope we are able to do the same. Check it out at www.highonleconte.com. It is our goal to give you the latest trail conditions, weather, and photos from atop Mt. LeConte. Welcome to the blogosphere! I look forward to staying current on what's going on atop the mountain. After an especially long and cold winter this year, hiking season is finally in view. For those of you planning a trip to the Smokies this spring or summer, and you need a cabin or chalet during your stay, please take a moment to visit our cabin listings page. Over the last several weeks we’ve added several new cabin and chalet rental businesses to our listings page. Oh yea, if you know of anyone that will be traveling to the Smokies this year, I would really appreciate if you could pass this information onto them as well. The 2010 season for the LeConte Lodge is March 22 through November 23. Reservations are required and can be made by calling 865-429-5704 or e-mail reservations@lecontelodge.com. We began booking 2010 reservations on October 1, 2009. Most weekends are now booked for the 2010 season. Some weekday reservations are available with the exception of June, July, early August and October. E-mail inquiries may take up to 7 business days to receive a reply. If you need an immediate response, please call the reservation office number, 865-429-5704. Also, don't forget, day hikers and backpackers can purchase a sit-down lunch in the lodge dining room by making reservations at least 48 hours in advance. You can call 865-429-5704 to reserve a spot. Lunch will be served from 12:00 noon to 3:00 pm Eastern Time. Day hikers also have the option of ordering a sack lunch to go, which does not require a reservation. As of March 6th, many of the roads and trails in DuPont State Forest near Hendersonville will be closed and will not reopen to the public until weather conditions improve and debris downed during recent ice storms can be removed. Wet and cold weather this winter has damaged trails and delayed cleanup of debris on roads and trails in the 10,400-acre state forest in the Little River valley between Hendersonville and Brevard. David Brown, DuPont State Forest supervisor, has ordered that some of the 80 miles of roads and trails be closed until conditions improve. All forest visitors are asked to abide by the posted trail closures. The roads and trails in DuPont State Forest, which is managed by the N.C. Division of Forest Resources, are shared by hikers, mountain bikers and equestrian users. Many trails that are not closed also have debris on them. For that reason, people are warned to use those trails at their own risk. The list of trail closures list will be updated on a weekly basis at the DuPont State Forest website. To see the current list, please click here. Last Friday, rangers in the Big South Fork National River and Recreation Area arrested four people in possession of a meth lab. On the afternoon of March 5th, two rangers were patrolling on Worley Road in the Kentucky portion of the park when they came upon a parked car with four people inside. Both doors of the vehicle were open and soft drink cans and trash were on top of and around the vehicle. As the rangers got closer, they could see the occupants of the vehicle beginning to move in their seats. They were leaning forward and making furtive movements with their hands and appeared to be hiding items as they approached. One of the rangers made contact and identified the foursome. They all appeared to be under the influence of alcohol or drugs. During a consent search, the ranger found a clear liter plastic bottle in the back seat. The bottle had a cap on it and contained an almost clear liquid with white and metallic flakes in the liquid. The bottom of the bottle had a multi-colored gritty substance in it. This was identified as an active methamphetamine lab (one-pot cook method). All four were arrested and transported to the federal jail in London, Kentucky. Charges are pending. Late last week Shenandoah National Park announced that facilities closed during the winter season will begin opening this month and will continue to open throughout the spring. Even though spring is just around the corner, park staff continues to clear snow from the unprecedented 2010 winter season. March opening dates below are tentative based on weather and successful snow clearing operations. Visitor Centers will be operated as follows: Harry F. Byrd Visitor Center will open March 26; Dickey Ridge Visitor Center will open on April 1; Loft Mountain Information Center will open on May 14, operating weekends and holidays only. Campgrounds will operate on the following schedule: Big Meadows Campgrounds will open on March 26; Lewis Mountain Campground will open on April 9; Mathews Arm Campgrounds will open on May 14; Loft Mountain will open on May 21, pending completion of a construction project to rehabilitate roads in the area. Elkwallow, Pinnacles, South River and Dundo Picnic Grounds are currently open. The remaining picnic grounds will operate as follows: Big Meadows Picnic Grounds will open March 26; Dickey Ridge will open on April 1; and Lewis Mountain Picnic Grounds will open April 9. Loft Mountain Picnic Ground remains closed. Concessioner-operated restaurants, lodges and associated facilities will operate as follows: Big Meadows Wayside will open March 19; Skyland Resort will open on April 1; Big Meadows Shower/Laundry will open on March 26; Lewis Mountain Cabins and Lewis Mountain Campstore will open on April 9; Elkwallow Wayside will open on April 16; Loft Mountain Wayside will open on April 30; Big Meadows Lodge will open on May 20; Loft Mountain Campstore and Loft Mountain Shower and Laundry will open on May 21. For more information about planning a trip to Shenandoah National Park go to http://www.nps.gov/shen or call the park at 540-999-3500. Several seasonal facilities in the Great Smoky Mountains will reopen this weekend. * Five of the Park's seasonal campgrounds will reopen on Friday: Abrams Creek, Big Creek, Cataloochee, Cosby, and Elkmont. * Deep Creek is scheduled to open April 1 and Look Rock will open May 14. * Road repair work will result in delayed openings for Smokemont and Balsam Mountain campgrounds, which are scheduled to open on May 28. * Group camping will be available starting on Friday at Big Creek, Cataloochee, Cosby, and Cades Cove. Deep Creek will open as usual on April 1, however, delayed openings will be at Elkmont (April 10), and Smokemont (May 28). 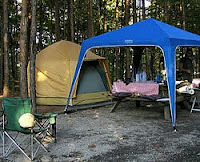 Reservations for group camping must be made through the National Recreation Reservation Service. * The Cades Cove Campground is open year round and is not affected by the Cades Cove Loop Road construction. * Horse Camps at Anthony Creek, Big Creek, Cataloochee, Round Bottom, and Towstring will reopen on April 1. To make reservations at three of the Park's developed campgrounds, and all group campsites, horse camps, and picnic shelters, visitors can visit www.recreation.gov or call 877-444-6777. > The Cades Cove Campground Store will reopen on April 1. The store provides groceries, camping supplies, firewood, ice, vending, limited food service, souvenirs, and bike rentals. > The Elkmont Campground concession will open this Friday. The concession provides firewood, ice, camper convenience items, and vending of soft drinks, newspapers, and snacks. > Secondary roads set to reopen this Friday include the Little Greenbrier and the Straight Fork/Round Bottom roads. Last week I received an email from Doug McFalls announcing the launch of his new website. Doug is the winter caretaker at the LeConte Lodge. This coming Friday Doug will be retiring his current website, www.lifeonleconte.com, a site known for some incredibly beautiful photography from the summit of Mt. LeConte. His new website, www.ReflectionsoftheSmokies.com, is already up and running, and promises to continue with even more inspirational photos from the Smokies. Doug also mentioned that the management for the LeConte Lodge has decided to do their own blog on their own website. Should be interesting to see how they proceed with this. Speaking of Mt. LeConte, during the months of December, January, and February, the mountain received more than double the average amount of snowfall. Mt. LeConte received 112" of snow overall during those three months; in an average year, it receives 51 inches. As part of its latest issue, Backpacker Magazine has published its winning entries from its readers' choice essay contest. In all, Backpacker published 14 short essays, including one by Greg Hoover who shares his secrets for finding quiet on the busiest trail in the country's busiest park - that would be the Appalachian Trail in the Great Smoky Mountains. Click here to read all 14 essays. The National Park Service (NPS) announced on Thursday that favorable pricing on large construction projects as part of the American Recovery and Reinvestment Act (ARRA) has resulted in savings of over 20% - totaling approximately $129 million. The Service will use these dollars to fund an additional 30 high priority projects across the country putting additional people to work in ways that will leave a permanent legacy for our national parks through critical facility improvements, infrastructure repairs, and energy efficiency enhancements. The NPS is also announcing the replacement of 26 projects with 36 additional projects totaling $9.3 million. Projects are being replaced for various reasons, such as prior completion with non-ARRA funds or because they cannot be completed within the Recovery Act timeframe. The NPS selected the replacement projects from existing contingency lists using established merit-based criteria for expediency of implementation, job creation potential and ability to address high-priority mission needs. The current list of the NPS ARRA projects can be found by clicking here. The American Recovery and Reinvestment Act provided $3 billion to the Department of the Interior. Of that amount, $750 million went to the NPS to fund job-creating investments in critical infrastructure and facilities, trail restoration, abandoned mine remediation, and energy efficiency and renewable energy. Back in January the N.C. Wildlife Commission proposed a new rule that would've resulted in elk losing their status as a species of special concern. This special designation was originally assigned as part of the reintroduction experiment of the elk to the Cataloochee area of the Great Smoky Mountains in 2001. With this rule in place, it has been illegal to shoot an elk — both inside the national park boundaries and outside the park. If delisted as a species of special concern, elk would've retained their status as a “non-game” animal, making hunting them illegal even if they wander outside of the national park. However, landowners would've been able to shoot problem elk without a permit under the proposed change. The commission said the proposal was put forward by its biological staff because they said the special status was no longer necessary. Yesterday, however, the N.C. Wildlife Commission voted not to remove the elk from the state’s list of Special Concern species. This was a clear victory to all the people who voiced their concern on this during the public hearing phase. The Commission also announced that is has approved of several changes to state hunting, fishing and trapping regulations. You can read more about these by clicking here. * Longtime hiker and Carolina Mountain Club member Bruce Bente will share pictures and stories from his trip last fall to Rocky Mountain National Park. Bruce will be at Diamond Brand Outdoors on Tuesday, March 9th, at 7 p.m. Diamond Brand Outdoors is located at 2623 Hendersonville Rd. in Arden. * Author Danny Bernstein will be presenting a slide show entitled Hiking North Carolina's Blue Ridge Heritage at the Henderson County Library on Thursday March 18 at 4 P.M. For each book sold, Diamond Brand Outdoors will donate two dollars to one of their favorite charities - Muddy Sneakers. The library is located at 301 N Washington Street in Hendersonville (call 828-697-4725 for more details). * Ms. Bernstein recently returned from a trip to Big Bend National Park where she spent time hiking in the Chisos Mountains. She has a couple of postings about her trip including several pictures on her blog. This Saturday, March 6th, the Chattanooga Hiking Club will host a trail maintenance day on the John Muir Trail in the Cherokee National Forest. Volunteers will be brushing out a section of trail that runs beside the Hiwassee River. Bring boots, gloves, lunch, and water. Contact activity leader John Rowland to learn details and to volunteer. The John Muir Trail is a 20.7 mile National Recreation Trail in eastern Tennessee that runs along the north side of the Hiwassee River in the Cherokee National Forest. It's named for naturalist John Muir and is said to follow the path he took during his travels from Kentucky to Florida. Mt. LeConte now has 50 inches of snow! Doug McFalls, winter caretaker at the LeConte Lodge, is reporting this morning that there are now 50 inches of snow on the ground at the top of Mt. LeConte! With warmer weather on the way, it looks like this could be the high point this winter for most snow on the ground. If you haven't been to his site recently, he has some outstanding pictures of some of the winter scenes on the mountain. Please click here to visit his site.